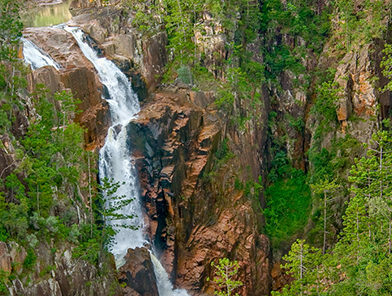 Sharman’s Rock-wallaby is a medium-sized rock wallaby that occupies rocky outcrops. 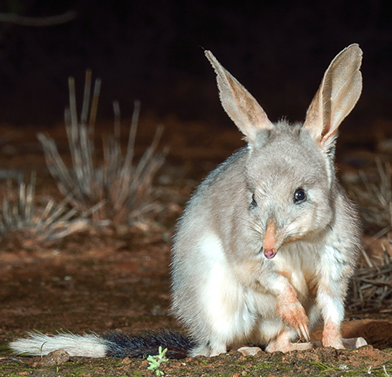 There are around 20 known subpopulations, of which 80% are found on AWC’s Mount Zero-Taravale Wildlife Sanctuary. Sharman’s Rock-wallaby is considered threatened because of its restricted distribution and their vulnerability to feral predators. AWC protects around 80% of the total population of Sharman’s Rock-wallaby at Mount Zero-Taravale. AWC monitors the population regularly using camera traps. 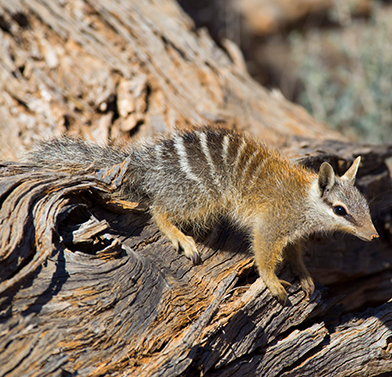 Our fire management is designed to prevent important habitat being consumed by wildfires, while maintaining a mosaic of early successional vegetation preferred by the wallabies as food. 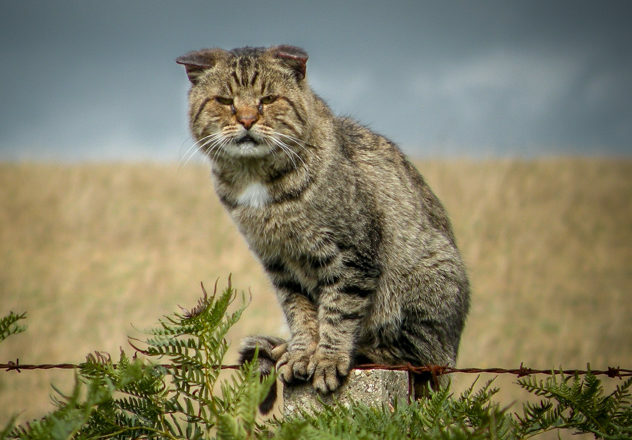 Our feral animal control measures target feral herbivores: there are no foxes on Mount Zero-Taravale and feral cat densities appear low. 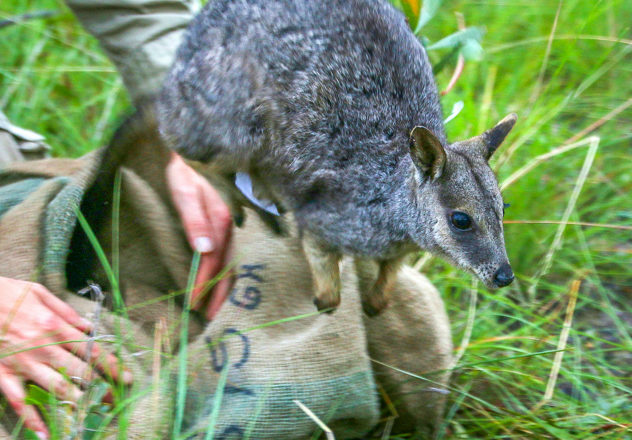 Additionally, AWC conducts ongoing research into the ecology and survival factors for the Sharman’s Rock-wallaby. Sharman’s Rock-wallaby is considered threatened because of its restricted distribution. 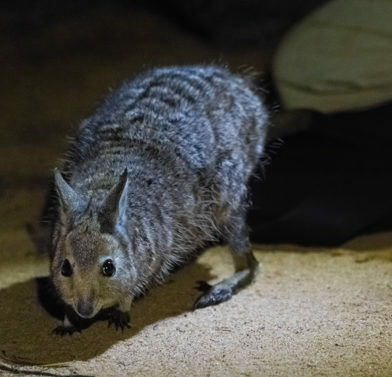 Rock wallabies are vulnerable to predation by foxes and feral cats. At present, foxes occur just to the south of the known range of Sharman’s Rock-wallaby, but cats are present throughout its range. Other threats include habitat degradation as a result of inappropriate fire regimes and competition with feral herbivores (cattle, potentially goats, deer). Sharman’s Rock-wallaby is a medium-sized rock wallaby which stands around half a metre in height and weighs around 4 kg. Males are only slightly larger than females. The plush coat is grey-brown to sandy-brown above with paler underparts and a long dark tail ending in a tuft. They have a pale cheek-stripe and a dark mid-dorsal head strip. The paws and feet are darker than surrounding fur. Sharman’s Rock-wallaby occupies rocky outcrops, usually with large granite boulders, where they shelter during the day. Wallabies emerge around dusk to feed in surrounding scrub and woodlands. Individuals are often seen basking in the early morning and late afternoon in sheltered locations within outcrops. Females with pouch young have been photographed on camera traps at Mount Zero-Taravale in May; breeding may occur year-round. Sharman’s Rock-wallaby has the most restricted distribution of any Rock-wallaby species. It is confined to an area of around 200,000 hectares of the Seaview and Coane Ranges, centred on AWC’s Mount Zero-Taravale Wildlife Sanctuary. The estimated total population is only 800 – 1,000 individuals. There are around 20 known subpopulations, of which 80% are found on Mount Zero-Taravale.